Summary: Rachael (and her husband and son) are in the Czech Republic for Roman’s U16 World Ball Hockey Championship. But… we made a little compilation episode which includes Rachael interviewing the captain and alternates of Team USA about the European hockey experience. 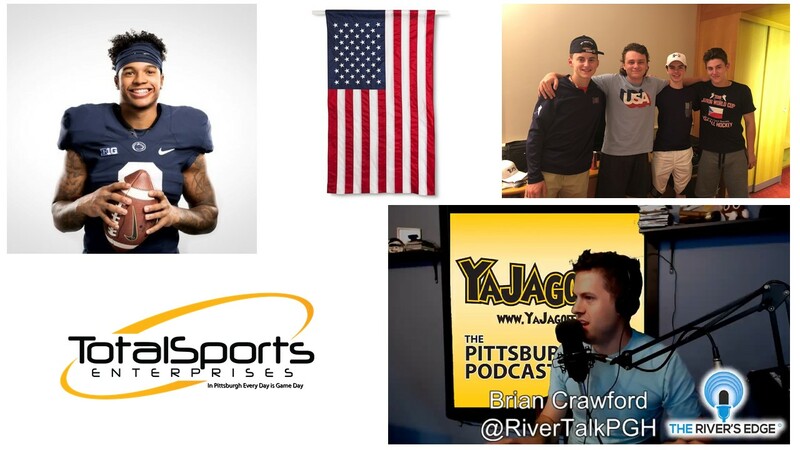 Before that, you hear Brian Crawford, The Rivers Edge, talk about adding the YaJagoff Podcast to its list of weekly shows as of July 5th, 10am and, thanks to Total Sports Enterprises, John and Rachael had a chance to welcome Steelers Rookie, Marcus Allen to Pittsburgh. Listen to the podcast NOW by hitting the play button below. If you don’t see the above play bar in your email, click the one below to listen while you work, rest or sweat in this 90+ degree weather. Sponsor: Total Sports Enterprises is at the Mall at Robinson has all of your bland and gold needs and, on top of that, another round of Mystery Boxes this next week along with everything you need for fundraising! Visit the store or tseshop.com for the fun of mystery boxes or your must haves in Pittsburgh sports. Question of the Day: We didn’t have one because.. well.. do YOU do your full job on the holiday? What was on the blog? Rachael’s Jagoffs written report of 6 days in the Czech Republic. 00:46 We made a connection thanks to Facetime to pull a show together for the Holiday. Rachael has a few thoughts on her 6 days in Europe. 05:25 Brian Crawford, The Rivers Edge, Pittsburgh’s leading internet radio station welcomes the YaJagoff Podcast to the Rivers Edge stream. One more place to hear the YaJagoff Podcast. 13:35 Steelers Rookie Marcus Allen is happy to be, what he calls “home” in Pittsburgh. He recently did his first public signing with Total Sports Enterprises. Who is his famous godfather? 26:31 Rachael interview 4 of the team members, Joe Milelo, Luke Malloy, Danny Cunningham, Roman Rennebeck of Team USA just after their run for the Bronze Medal in Prerov, Czech Republic. 38:10 Closing thoughts from the Czech Republic.. yikes! Ain’t nobody blowin kisses to say goodbye to Prerov! Public Transit? Can’t Get a Seat?